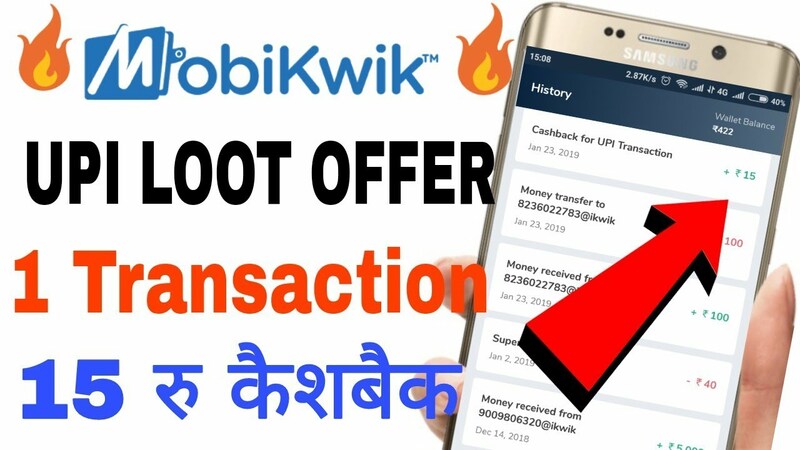 Mobikwik – Get Rs 15 Cashback on 1st UPI Transfer of January Month. If you haven’t transact with Mobikwik UPI this Month, Then Here is an awesome deal for You, Get Flat Rs 15 Cashback on your 1st UPI of the January Month Transfer of Rs 100+ to any @ikwik VPA. Offer valid for once per user. So Hurry up and avail this offer now !! 5. Now Initiate your 1st UPI Transfer of January MONTH from your Mobikwik App to any @ikwik Address of Rs 100 or more. 6. You will get the Rs 15 Cashback in your wallet/UPI link bank account after 72 hours. 4. Offer valid only till 31st January 2019. 5. Users who transferred money using UPI between 1-20th January won’t be eligible. 7. If the sender or receiver has de-registered VPA even once, those users will not be eligible for cashback.